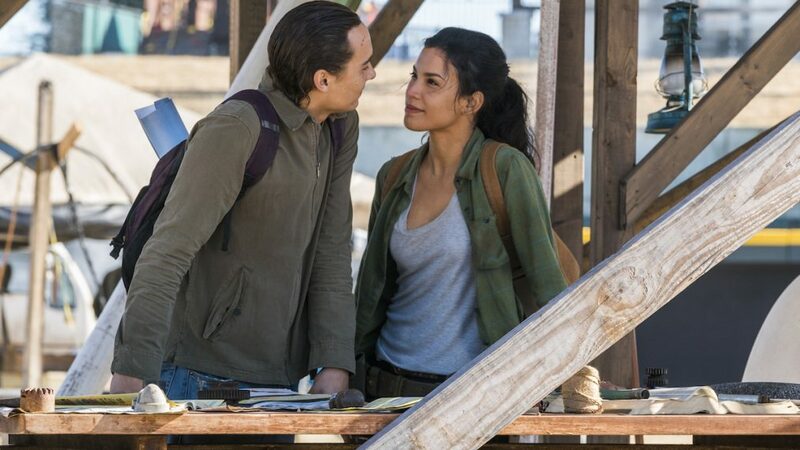 Well, if that episode didn't beat all, Fear the Walking Dead fans. With kinder, gentler emotions at a premium for years on both The Walking Dead and Fear the Walking Dead, Sunday night's FWTD outing "Laura," gave us a welcome case of the feels from start to finish. The episode, which took place almost entirely in the Before, provided the backstory of how Garret Dillahunt's John Dorie and Jenna Elfman's Naomi/Laura met and, if only for the briefest time, fell in love. An ill-fated supply run in the Before leads to telling revelations in the After. With stellar performances from both Dillahunt and Elfman — the only two characters in the episode, save for a nice moment with Lennie James' Morgan Jones at the end—"Laura" gave us a chance to sit back and wallow in niceties that no longer get much play in the apocalypse. New love. A good game of Scrabble. Fishing. Sharing your secret sorrows with someone you know will keep your confidence. And, despite what Luciana told John last week, the hope that these two will see each other again. Here are our 5 top takeaways from "Laura." We open the episode with a reveal of John's life after the apocalypse dawned but before he left his cabin behind. Turns out, he'd made himself a little one-room shanty in the woods by a river, digging a maze of trenches in front of his home to slow the progress of the walkers who keep washing ashore. There, he played Scrabble against himself, foraged for berries and prickly pear, paid Tuesday visits to a country store called Bill's and hosted one-man movie nights with titles he properly checked out from Bill's and faithfully reviewed on the return sheet. After he helped stitch up the nasty gash in his new guest's side and correctly assessed her wariness, John skipped asking for Naomi's real name and says he'll call her Laura, 'cause she looks like one. She's still hellbent on leaving, but his not prying seems to diffuse her eagerness to do so, at least for a bit. Pretty soon, they're playing Scrabble together, having fishing lessons and repairing the gap in a nearby bridge's side rail that's allowing the walkers to tumble into the drink. A few nights in, after the pair companionably watches movies together and explores new recipes for makeshift brittle, John wakes up from a snooze to see Naomi gazing at him with tears in her eyes. "I lost my child," she whispers, then creeps away to bed. Though she slowly warms to his down-home charm and their bucolic times on the river, Naomi always seem poised to go. She unsuccessfully to crib his car (revealing that she did indeed live in another camp, in the process). She snitches one of his guns, if only for safety when they go to fix the bridge. And her haul from Bill's consists of stuff not to stock the cabin to her liking, but to be useful when she's back out on her own. The actress's return was up in the air due to an unsettled contract. Though the former cop carried a gun on duty, he preferred to show off his skills harmlessly, at a Wild West attraction called Humbug Gulch. Hence, the fancy box of matching, white-handled revolvers. After John steadfastly refuses to shoot the walkers, even after it nearly cost the pair their lives while repairing the bridge, Naomi realizes his aversion is not about gunning down walkers. It's about gunning down anything. Since she shared a painful secret of her own, John shares the reason why. One night, on his way home from Humbug Gulch, he witnessed a gas station robbery. The bad guy refused to drop his gun. John— still sporting his Humbug revolvers—fired a shot to hobble him, but the guy turned and took the bullet in an artery, instead. He bled out before help could arrive. 7. Zombies know teamwork makes the dream work. Even if they don't have brains to know with. In one of the episode's rare eye-roller moments, a herd of walkers surrounds the Jeep John and Naomi used to block the bridge gap and shoves 'er right out of the way. They're abetted by the behind-the-wheel walker John Dorie hacked to a pulp—the only time he annoyed his girl—who undoes the brakes when what's left of his skeleton fails. It's a laughable moment, but necessary. It's necessary, because the walkers need access to river to come after John and Naomi in the night, in a sizable herd that nearly overwhelms them. Especially when some walkers use other walkers as bridges over the trenches and advance on Naomi, who tumbles backward into a pit, a pile of undead atop her. The only thing that saves her? John Dorie, duel wielding his revolvers in the knick of time, then twirling them out of habit. Naomi calls him a hero and says she's lucky to have washed up in his yard. He tells her he loves her, but he didn't want her to know because she's just going to leave. Either way, he needs her to be alive, because if she's alive, the world is alive (no, you're crying). The gesture earns him a kiss and a bedmate. But only a bed mate. In the morning he wakes up alone, Naomi's shoes swapped out for the boots he offered her and "I LOVE YOU TOO. I'M SORRY" spelled out in Scrabble tiles on the tables. Turns out, Morgan and John didn't go their separate ways after Al left with Luciana, Strand and Alicia. They're sitting in the sunshine, John having just told Morgan the story we watched play out in the Before. John shows Morgan the I LOVE YOU TOO tiles which he keeps in a tin in his pocket. He wonders if Laura might have stayed longer if he'd waited to confess his love. "No," says Morgan, emphatically. "Not in this world. Waiting—that’s how you lose people." "It’s stupid to say, but I believed we’d have a second chance," John responds. "Stupid." And then Morgan says it: "Maybe we still do." Not you still do. We. Morgan says Alicia, Luciana, Strand might believe that the only thing left is to fight and kill and die, but he knows John Dorie doesn't believes it, too. John admits he's right. And Morgan—smiling the first not-pained smile I've seen since his days with Eastman—says this. "We’re alive. We’re part of the world. Let’s not waste another second." And off they go. So what say you, FTWD faithful. Did you enjoy the break in the action to let love (momentarily) rule? Or are you all about the apocalypse and the simmering war with the Vultures? Do you think Naomi is really dead—or might true love rise again? Is there hope for Morgan becoming other than the guy who watches people die, or is he just trying to keep hope alive in someone the virtue might actually serve? It 'takes a few episodes to reveal itself' says the actor. • Will you forever think of soup as "the blanket of food" after this episode? • Will you test drive John's caramel/butterscotch/Black Jack brittle recipe? • How 'bout that Big Mouth Billy Bass that John uses as an oh-so-appropriate alarm clock? • Anyone else have Christopher Cross' treacly "Think of Laura" stuck in their head, too? Laugh. Don't cry. You know she'd want it that way.